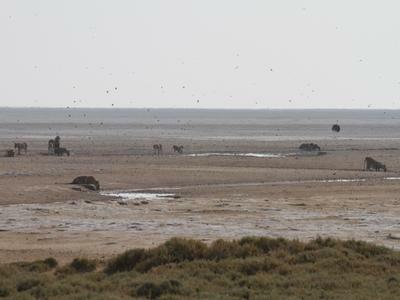 We spent 8 brilliant days in Etosha and had so many memorable experiences it is hard to choose one. 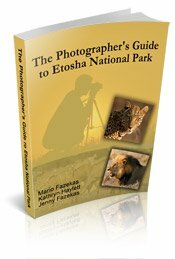 I found the Photographers guide to Etosha eBook indispensable!! A snip at just over 12 quid! And no, I am not affiliated to it in any way. We even bumped into Kathryn Haylett, one of the authors, at Nuamses waterhole on the 3rd October, after I recognised her fantastic photo platform vehicle! I showed her the photo guide and I think she was delighted! We had an amazing Safari to Okondeka waterhole north of Okaukuejo camp on the 4th October. We left Okaukuejo just after sunrise and were one of the first vehicles on the road North to Okondeka. On the way we drove slowly and were amazed to come across a sleeping spotted Hyena right next to the road. Even our noisy Diesel Toyota Hilux did not disturb her! 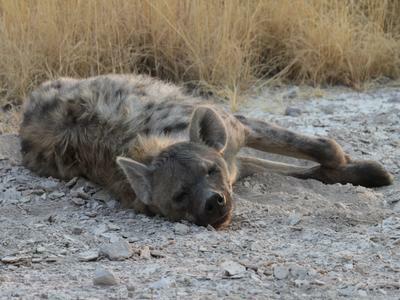 After a few photos, we left the Hyena in peace and continued on our way to Okondeka. We arrived here to find we had the waterhole to ourselves not another person or vehicle in sight! We parked in pole position just adjacent to the trees on the bank to the left of the main road! We scoured the tree line and Etosha Pan with binoculars, to look for any sign of the big Lion pride that is known to frequent the area. I had this on good authority after a chance meeting with some other British self-drive safari people, we met at Onkonjima on the way to Etosha. 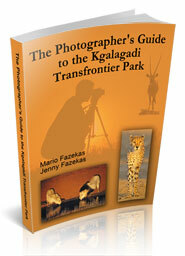 to scour the horizon and suddenly we saw several Jackals running at full pelt across the pan! Although a long way off something had clearly spooked them! Still no Lion sightings and we had been there for the best part of an hour and suddenly spotted a big Lioness that had been sleeping somewhere in the grass just in front of us! She got up and moved away from us to have a drink at the waterhole. Whilst watching her through the binoculars, we suddenly could see several Lions, Lionesses and cubs padding across the pan to the waterhole after a night hunting out on the pan. Wow what a sighting! 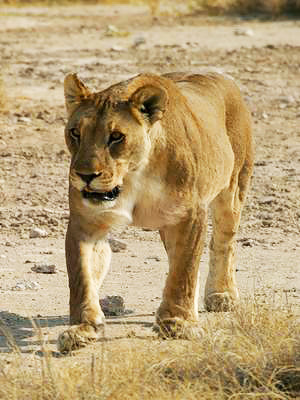 Meanwhile the first Lioness started to walk back towards us = all of a sudden she started chasing a Jackal - the chase was very fast and she killed the Jackal with one bite! The chase was so quick I did not even have time to photograph it! I only got a photo of the Lioness standing over the dead Jackal! Meanwhile the other Lions, which were drinking at the waterhole, started to walk towards us! 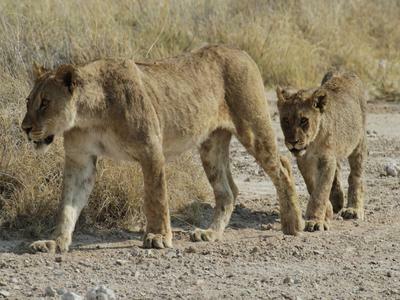 There were about twelve or thirteen of them, two males, several large females and a good few cubs of varying ages. What a sighting – and now they were heading straight for us! I had not realised it, but several other vehicles had by now, also stopped by us after spotting the Lions that were heading our way. The Lions then settled down under the trees up on the bank on our left side. We were rewarded with the most amazing close encounter you could hope for in Etosha, as Lion after Lion walked straight in front of us!! A truly awe inspiring moment and all before 9am in the morning! Certainly worth hanging around here for that! Thank you for sharing your great story and fantastic pics with us - patience and knowing where to find your subject helps a great deal. It is stories like this that make Kathryn and us feel the ebook was worth doing...hard work but if we can help people like yourselves by sharing our knowledge, then it was worth the dust, sweat and many, many miles of travel! It seems that knowing where to go and then having a bit of patience rewards the photographer. All the cars that left after spending just a few seconds there are still asking other visitors "have you seen any lions"! Pity you missed the lioness grabbing the jackal. 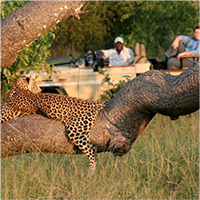 Just goes to show you cannot relax while on safari! You've got me cleaning my cameras and packing my bags for Namibia! What an awesome experience you had David and Jacinta! 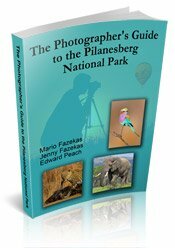 Your strategy to find subjects, such as lions, is a combination of tactics - using a guide like our eBook, speaking to other visitors and then having patience! Well done on a very successful safari and I'm sure you are both already planning your next Etosha safari!